The name Penang is derived from the word 'pinang', the Malay for the betel or areca nut palm (scientific name Areca catechu), many stands of which can still be found in Penang to this day. The betel nut is a product of great cultural and symbolic significance to the Malay, being used in everything from marriage ceremonies and shamanic rituals to cosmetics. Its most widespread use was as one of the ingredients used in 'sireh' - a concoction that consists of shaved betel nut fragments, lime and cloves wrapped in fresh palm leaves and chewed as one would chew gum. As it is chewed, it forms an aromatic mixture which colours the lips and saliva red and is reputed to produce mild narcotic effects. The significance of the betel nut palm to Penang is not limited to just its name. The modern-day tricolour flag of Penang also features the ubiquitous tree. It is likely that Penang was known by its Malay name Pulau Pinang since it was first settled by the Malays. In 1591, the 'Edward Bonaventure', the vessel of English adventurer Captain James Lancaster; visited Pulau Rimau, an island just south of what he called 'Poolo Pinang'. Manoel Godinho de Eredia's map of the Malay peninsula in his 'Description of Malaca' in 1613 refers to the island in Portuguese as as 'Pulo Pinam'. However, Penang was also to known to Kedah inhabitants at the time as Tanjung Penaga (Cape 'Penaga') and that particular name was even used in Government land grants as late as 1800. Up to today, there are Kedah folk who refer to Penang as 'Tanjung'. The Penaga was a hardwood tree used to make walking sticks and its leaves were reputed to have medicinal value. There also still exists the town of Penaga on the Kedah coast opposite the island. W E Maxwell's 'Notes and Queries' (1887) notes an account that appeared in Logan's Journal of the Indian Archipelago' of the voyage of the legendary Malay seafarer Nakhoda Ragam that gives an even earlier name for Penang. According to the legend, Nakhoda Ragam traded in the waters along the length of the western coast of the Malay peninsula from Lingga at the southern tip to Kedah. It was said that, because he found no higher or larger isolated island in these travels, he named it Pulau ke Satu ('single island'). 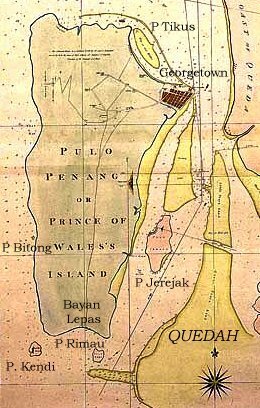 Nahkoda Ragam was also reputed to have given the names to the various bays, rivers and points of Pulau Pinang. On one occasion, when sailing off the south-western end of the island, his 'kendi' or water-pot fell into the sea, and it was immediately transformed by the 'jinn' (genii) of the place into an island which still bears the name of Pulau Kendi. On leaving Pulau Kendi, he pulled into a bay on the southern coastline of Penang. At the mouth of the river which flows into the bay, he released a tame bird called Bayan, and thenceforth the place has been called Bayan Lepas (or the 'free Bayan'). At another voyage, he attempted to land again at the shore of that bay. However, the sea was too rough and as his boat pulled away from the shore, it was nearly swamped. The boat rolled and pitched heavily, and as he was steering her off, his exertions loosened the knot (or 'sanggul) of his long, flowing hair. He therefore named the place Gertak Sanggul ('shaken knot'). On another occasion, while passing Pulau Bitong on the western coast of Penang, he encountered a heavy gale. On passing a point on the island, the storm grew fiercer and he saw his wife's face turn pale with fear. He henceforth referred to that place as 'Pucat Muka' or 'pale-faced'. Another sea captain - Captain Francis Light - landed in Penang on 17th July, 1786 to acquire it for his King and country. He too pondered on what new name to give to the island to mark this momentous event. He finally decided on naming it after England's regent - the Prince of Wales, who was to later be King George IV of England. The island was, in fact, formally named Prince of Wales Island during a flag-raising ceremony there on August 11th - the Prince's birthday. The name, however, was rarely used - even the British administration always referred to it as Penang - and Prince of Wales Island was quickly forgotten. He named the settlement they built there after King George III and that name - Georgetown - has lasted to this day. 'Notes and Queries' edited by W E Maxwell, Malaysian Branch of the Royal Asiatic Society (MBRAS) Reprint 15, 1997. 'Eredia's Description of Malaca' translated by J V Mills, Malaysian Branch of the Royal Asiatic Society Reprint 14, 1997.